Abstract Aim: The aim of this desktop study was to review all workplace interventions having a nutrition component, published in peer-reviewed literature between 1995 and 2006, and to document activities that were successful, as well as possible barriers to their success. Methodology: A systematic review of workplace studies revealed 41 interventions, of which 30 complied with the predetermined search criteria. 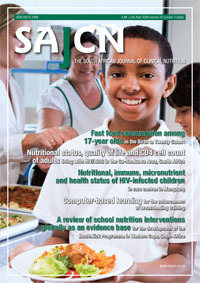 The following outcome measures were considered in the evaluation of the interventions: (i) changes in nutritional knowledge, attitudes, self-efficacy, intentions and stage of change; (ii) changes in dietary behaviours; (iii) changes in clinical/physical markers, such as: body weight or body-mass index (BMI), blood pressure (BP) or serum cholesterol concentrations; and (iv) process and/or policy outcomes. Results: A large number of diverse workplace interventions were successful in changing outcomes positively in the interventions evaluated. The following were key success factors: i) there was a nutrition and physical activity component; ii) dieticians were involved in nutrition education; iii) changes occurred in the cafeteria/canteen, which increased the availability of healthy food options and advertised them accordingly; iv) tailored feedback on diet (and clinical values) was given to subjects; v) employees were involved in planning and managing programmes; vi) the reduced prices (of healthy food items) in vending machines encouraged employees to buy healthier options; and vii) the stages of change theory was most commonly associated with best practice outcomes. Conclusions: Numerous workplace interventions have shown significant improvements in employees’ health and behaviours. However, it is necessary to plan intervention programmes based on the existing evidence of best practice.